Yubu chobop is a Korean-styled version of a Japanese dish called inarizushi which is an unusual form of sushi where seasoned rice is stuffed in a triangular-shaped pockets made up of sweet deep-fried tofu. Ingredients can vary but pre-made instant kits are usually used when preparing this dish so no real "cooking" is involved unless fresh ingredients are additionally added. Pre-made kits contain tofu pouches or shells, seasoned mix (assortment of sesame seeds) and packets of vinegar which are readily available at local Asian groceries or supermarkets in the refrigerated section. Optionally, some may add other fresh ingredients such as finely chopped sweet peppers, onions, carrots and/or spam to the rice mix which is usually white & sticky grain. When eaten as a whole, each stuffed shell is full of rich flavors where it’s somewhat sweet but yet a bit sour with a hint of vinegary taste but will surely please everyone’s taste buds. Many will consider this dish as comfort food and it's great for picnics or at parties as finger food – it can be served and eaten hot or cold. If you enjoy sushi, you'll be sure to like this dish as well. Freshly cooked white rice, approximately 2 cups. Click here for directions. As an optional step, dice spam into tiny pieces and fry for approximately 5 minutes with oil. In a large mixing bowl, thoroughly mix in cooked rice and instant packaged contents along with spam if desired. 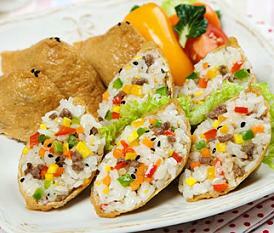 Open individual fried bean curd pockets and fill in mixed in rice content. Serve on the plate or package it for snack/lunch.